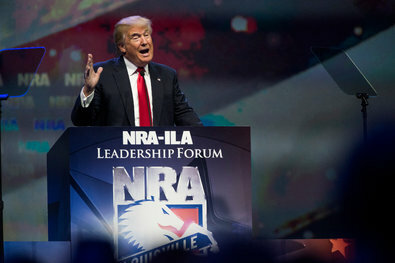 Donald J. Trump at the National Rifle Association convention in Louisville, Ky., on Friday. Mr. Trump, accepting the endorsement of the National Rifle Association, said Mrs. Clinton’s desire for stricter gun controls would put law-abiding citizens at risk. Democrats have rarely had to face their own medicine like this. He is much less inhibited than pas GOP candidates in challenging his opponent. It also taps into the anger that many have toward the way Democrats have tried to run this country for the last seven and a half years.